Open Farm Sunday 2011 takes place on June 12. It’s your chance to hi-five your local Farmer and to thank him for his great work and tasty produce. What is Open Farm Sunday and what’s it all about? I hear you ask. Well, it has a lot to do with discovering at first hand all about life on Britain’s farms – providing us with an opportunity to visit a real working farm, meet the animals and have fun for all the family. Farmers across the country are currently preparing to open their farm gates on Open Farm Sunday (12 June 2011). This annual event organised by LEAF (Linking Environment And Farming) is a must for anyone interested in how farmers produce our food, and the ways they care for our countryside too. This year over 450 farms across the country are involved in putting on something eventful for us. So why not take time to soak up the scenery, experience at first hand what it means to be a farmer, taste their homemade and grown produce – to really get in touch with the land that feeds us. To keep up to date and share your farm experiences follow: twitter.com/openfarmsunday. Make your own woolly sheep picture! The rest of the farm is open 9am – 5pm for you see the animals (Blaze being my favourite but I’m also fond of Buttercup the cow too :), or you can browse the plants on sale in the Garden Centre, find out about their excellent recycling facilities, then why not finish the day by treating yourself to a slice of cake in The Farm Kitchen? Are organising tours of the milking parlour, milk dairy, a walk around the farm, off road train rides, with different ages of cows on display for the public to gawp over. An outdoor BBQ will also be put on serving sausages from Bradfield Meats for their #OpenFarmSunday BBQ – I’ve been told it’s going to be a feast! 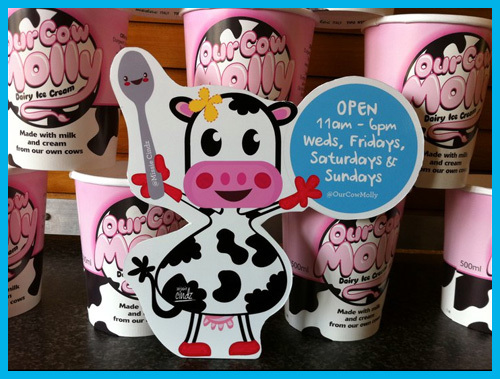 If I was you, I’d treat myself to a scoop or two of their delicious award-winning ice cream from the farm shop too – because it’d be just plain rude not to! :) All this is free admission. I’ve been told other Sheffield Farms such as Whirlow Hall Farm and Green Top Farm are also planning events. So get out into the countryside (afterall green is definitely this summer’s must have colour! ), it’s nice to reconnect with nature, learn new fun things so make sure you pay your nearest farm a visit and hi-five your local farmer – I know where me and the fork will be! Why not Twitpic, tweet and share your day out with me? I’d like to know what your local farm is doing (Follow me: @missiecindz). I’m having a very tasty time on my Food Adventures – gallivanting up and down Sheffield on my smiley fork. It’s proving a delicious experience, just take a look at my photos (as seen on FlickR, Facebook ‘Missie Cindz Food Adventures‘ and TwitPic) – you can clearly see that I’m eating my way through Sheffield! 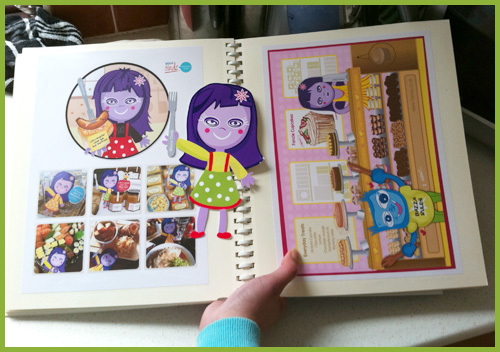 If you happen to see Missie (my alter-ego companion) in your local eating joint (as seen in the pics above), remember to tweet me or @toastmag a photo of where you’ve found her (Toast Magazine will print your picture in their mag if you’re chosen), I’m always keen to find out where Missie hangs out myself (I easily loose track on where we are most days with all this fooding around! ), also add with your tweet the conversation hash tag #missiesfoodadventures so that we can all follow her food/road trips. 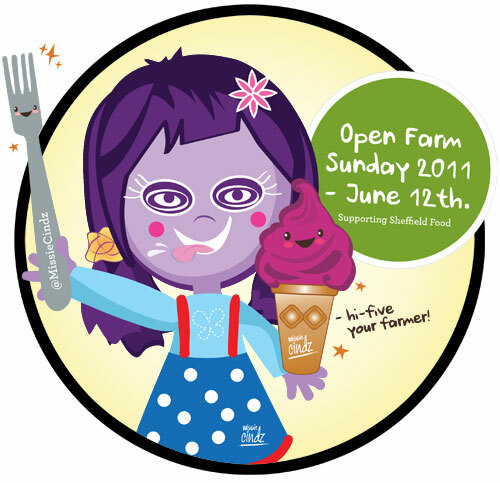 Finally, don’t miss Open Farm Sunday on June 12. 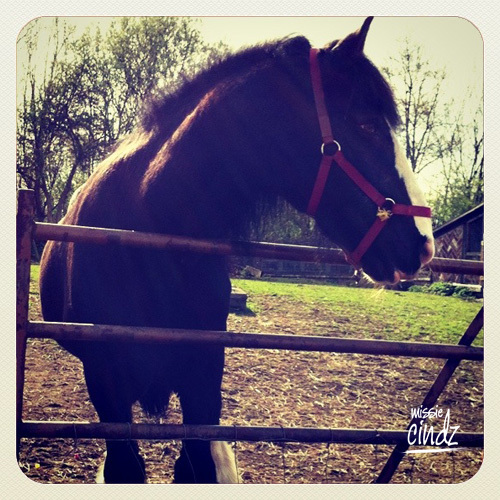 The opportunity to visit a real working farm, meet the animals (not all are smelly! :) and have fun with all the family.